A passport point suddenly "expires" in the exam. There is no field for this. Just edit the item-and click on Field name, you will see a dialog with password expiry field. You can set a no. of days when it will expire since it is created/changed. All expired will be visible in Password Audit in sidebar. The field 'expires after' is without hooks and zero days. @PeterM Password expiry is calculated from the date the password is created/changed. For example if you created/changed a password on 1 Jan 2019 and added a 10 days expiry today, it will be shown as expired since its has been 15 days since it was created/changed. @PeterM You need to tick the option first (checkbox). Than you can change the value to desired number of days. 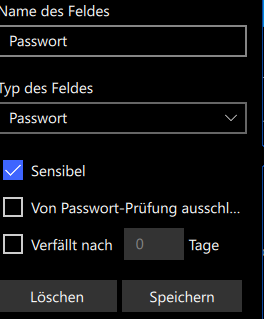 I have clicked on the checkbox, but the program does not allow storage with 0 days. The password check will expire, even though zero days are in the record. I delete the record and create it again. OK. Zero is not considered as a valid value so checkbox if unchecked for next time. Did it happen with non-zero value as well? With another value you can save. But it also shows 'expired' with 500 days. Although the change was 152 days ago.